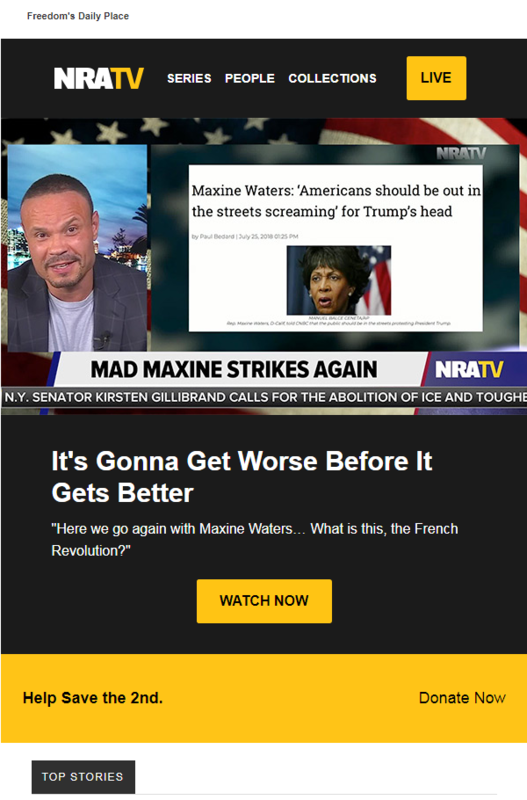 NRATV host calls Rep. Maxine Waters "un-American"
DAN BONGINO (HOST): Again, here we go again with Maxine Waters. “Americans should be in the streets screaming for Trump’s head.” We’re now making decapitation analogies again? What is this, the French Revolution? Ladies and gentlemen, it’s going to get worse before it gets better. NRATV later tweeted out Bongino’s segment on Waters, attributing the entire fake quote to her. In reality, Waters told CNBC host John Harwood that “Americans should be out in the streets screaming to the top of their voice” over President Donald Trump’s insinuations that he can pardon himself and his refusal to condemn Russian President Vladimir Putin for his country's interference in the 2016 elections. UPDATE: The segment featuring the fake quote was the top story in the July 26 edition of NRATV’s daily newsletter, which included an image of the misleading Washington Examiner headline and a quote from Bongino implying Waters made a decapitation analogy. On October 18, BuzzFeed reported that the Twitter account @TEN_GOP, active until August and frequently mistaken for the official account of the Tennessee Republican Party, was one of many linked to a Russian disinformation campaign intended to impact the 2016 presidential election. BuzzFeed reported that @TEN_GOP was responsible for several “deliberately outrageous” messages, including a popular hoax claiming a photo of the Cleveland Cavaliers’ NBA championship parade was in actuality a Trump rally, and that Twitter took “11 months” to close the fake account, even after the real Tennessee Republican Party repeatedly informed Twitter that the account was an imposter. On October 23, Media Matters published in-depth research showing how @TEN_GOP used and was used by fake news purveyors to engender chaos and confusion. One finding was that some of the articles written by fake news purveyors that were based on the account’s tweets included attacks on Waters, who has been a staunch critic of Trump. Also, in addition to hyping crowd sizes and pushing voter fraud lies, @TEN_GOP tweeted multiple anti-Muslim comments that were repeatedly cited in several Islamophobic fake news articles, racking up tens of thousands of engagements on Facebook, Media Matters found. The Trump campaign also used a claim that echoed @TEN_GOP at least once, when Digital Director Brad Parscale promoted a supposed anti-CNN rally that various fake news purveyors had also pushed, citing the account. WASHINGTON – Congresswoman Maxine Waters (CA-43), Ranking Member of the House Financial Services Committee, released the following statement and attached letter to Twitter CEO Jack Dorsey in response to a report from BuzzFeed News and Media Matters revealing that she and her congressional district were targeted by at least one Twitter account that was linked to a Russian firm tied to the Kremlin. In her letter to Twitter’s CEO, Congresswoman Waters requested that the company disclose all of the accounts linked to Russian or Kremlin-linked firms that targeted her during the 2016 election and throughout this year until their suspension. “While I have never publicly discussed it before today, I have been aware for some time that I was targeted by Russian operatives whose interests were aligned with Donald Trump. For as long as I have been vocal about Trump’s allies, whom I have called the “Kremlin Klan” – those former and current officials connected to Trump with ties to the Kremlin, Russian oil and gas interests, and pro-Russian operatives in Ukraine – I have often noticed that every time I tweeted about Trump and Russia, dozens of strange accounts would immediately tweet various lies and falsehoods that fringe alt-right websites would subsequently use as a basis to write fake news stories. Since much of the public discussion of Russia’s interference in our democratic process thus far has focused on Russia’s influence in the presidential election, I think it is important for the American people and my colleagues in Congress to understand that Members of Congress and their efforts to communicate with their constituents may also be vulnerable to this type of foreign disruption. “According to BuzzFeed’s reporting, one the Russian accounts, @TEN_GOP, which masqueraded as the Twitter account for the Tennessee Republican Party, was allowed to tweet many lies about me and my district for months and was particularly active during one of my town hall meetings earlier this year. It is most disturbing to me that this Russian account pushed an “Impeach Maxine Waters” hashtag that ultimately trended on Twitter during that afternoon. The hashtag appeared to be coordinated with large, elaborate posters that were posted outside the town hall venue by disrupters, who were probably given the financial resources and assistance necessary to carry out their campaign of disruption. It is for this reason that I am now calling upon Twitter to provide detailed information regarding all Russian-linked accounts that targeted me and my congressional district. Language in this post has been changed for clarity. Rush Limbaugh: Rep. Maxine Waters Is "The Latest Lunatic Leftists Have Embraced As A Big Star"
Rep. Maxine Waters: "Bill O'Reilly Is Not Going To Be Recorded Favorably In History"
On MSNBC, Rep. Maxine Waters Calls For Prosecution Of O'Reilly And Fox News' "Sexual Harassment Enterprise"